Arsenal manager Unai Emery tweeted a training ground picture today that may well hint at a quick return from injury for midfielder Lucas Torreira. The summer signing from Sampdoria was taken off in Uruguay’s last game, and could be seen with an ice pack on his leg as he watched the remainder of the match from the bench, as reported by the Metro. 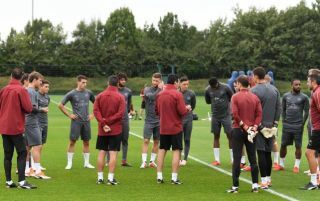 However, Arsenal fans look like they needn’t worry as Torreira seems to be involved in Emery’s latest training session, pointing towards a return for the next game against Newcastle. The Gunners travel to St James’ Park on Saturday, and Emery will need a fully fit squad to choose from if he is to continue his side’s recovery from a poor start to the season. Arsenal lost their first two games against Manchester City and Chelsea, but have since bounced back with wins against West Ham and Cardiff City. Torreira shone in that last game, assisting Alexandre Lacazette’s winning goal with a neat pass. The South American starlet has looked impressive whenever used, though Emery seems to be easing him in slowly after bringing him to England this summer.